Before I had the chance to try these specialties at Monte-Carlo, what seemed to be a fitting place to eat the national dish of Monaco, the Upper East Side French restaurant promptly shut down. Luckily there was at least one other place in the city to track down barbajuans, at a modern French brasserie called Maison Hugo. Barbajuan means "Uncle John" in Monégasque, a dialect of Italian spoken in Northern Italy and Monaco. These small fritters can also be found on other parts of the French Riviera and Northern Italy, but call their birthplace the Principality of Monaco. 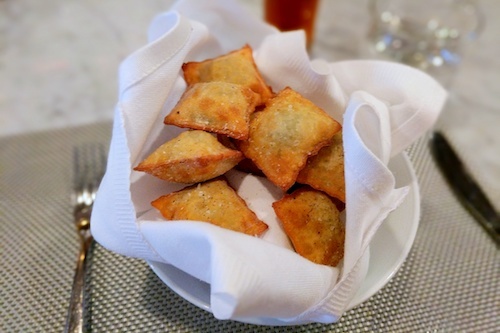 Generally the small fried square appetizers are filled with Swiss chard and ricotta, and may contain spinach, onions, other cheeses, olive oil, and egg whites. It is similar to ravioli, or if you are from the United States, to Totino's Pizza Rolls, every college student's main dietary component. Between jobs, I had these as a snack at Maison Hugo, pictured below. During lunch they are $10, but they ended up charging me the dinner price of $12. It is possible you may happen upon these on another menu around town. If so, please give us a shout so we can add the listing and try another version.